Maximum performance in sports ( … ) going to one’s limits at any cost, even the humiliation of a creature [the horse] is de facto tolerated. ” ( Stahlecker , 2012 Franckh – Kosmos Verlag ) . 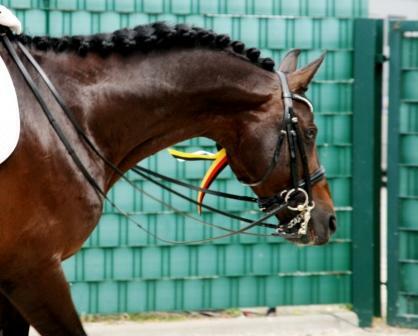 Today’s dressage is seen (and practiced) by most people only as a competitive sport and no longer perceived as what it used to be at the core: the Art of Riding (Reitkunst). The mere choice of words “ we work our horses ” that we use every day, should make us double-think. It’s no wonder that things such as doping scandals and controversial training methods occur in such a setting of hard work and performance. You only see what you want to see Stahlecker believes that we should see more than a sport’s perfromance and an exalted show in the dressage arenas. Instead, we should be seeing a harmonious partnership between horse and rider that show us the art of riding. Stahlecker is convinced that what we see on the show grounds today has nothing to do with the art of riding. The prevailing performances of sport machines is made acceptable by different players. Firstly, there are the judges and other officials, who judge the riding. Than, there are also the spectators . Interestingly, these two parties often seem to work together. A good example of this good interaction is the stallion Totilas, who had not only huge success in sports, but who was also highly coveted by spectators and the press. Mind you, all of this has happeened despite people knowing of the controversial training method of Rollkur that have been used (of course there is this counter-movements, but they are shockingly low ). The art of riding is based on aesthetics and this leads (inevitably) to respect for the natural characteristics of the horse. What we see today is a disregard of the natural characteristics and movements of the horse to an allmost unimaginable degree. 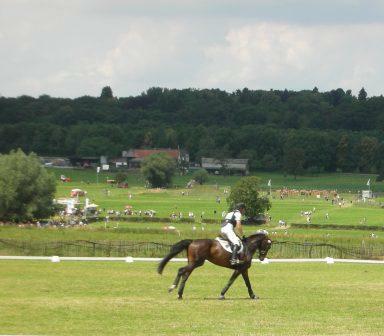 Contemporary dressage is more a kind of show or staging. It pretends to show refined natural movements, but instead does the opposite. Let me give you an example to illustrate this: Imagine a paddock and two horses playing and running in it. To every movement they do, their silhouette changes. If the horse sprints fast across the paddock, its silhouette is not round (being collected) but rather long/stretched. Is the horse however aroused and pounces up and down the fence, the silhouette is rounder and shorter (collected frame) . These two “ frameworks ” are fundamentally different from each other and belong to the respective movement of the hors ein that moment. 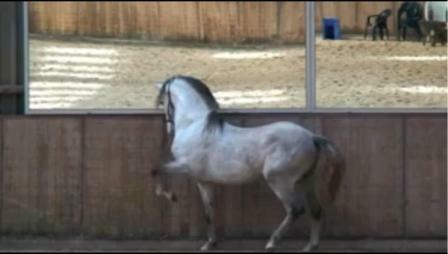 Without stretching, the horse cannot push forward with big movements that cover lots of ground. Likewise can a horse not piaffe if its silhouette is long and stretched. Thats simply impossible. Unfortunately, in the dressage ring we nearly almost exclusively see horses in extended gaits that dont have a strechted silhouette in horses. 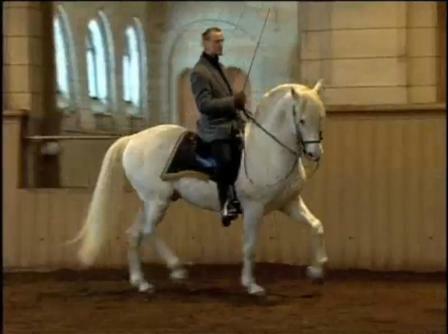 The great movements (usually only with the forehand that go upwards instead of up-and forwards) without being strechted or coming forward, and the rear legs pushing from behind the horse with small steps, is not only unsightly, but also absolutely unnatural and forced. To every extended gait, an extension of frame is needed. 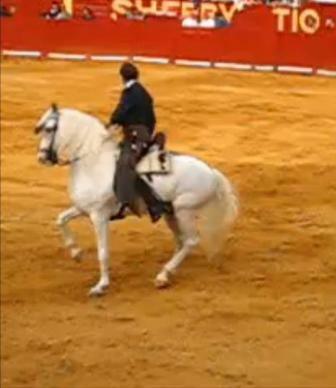 Thus, what we see in those arenas are horses that are being asked to move in a certain posture that (in this combination) doesnt not exist in nature. 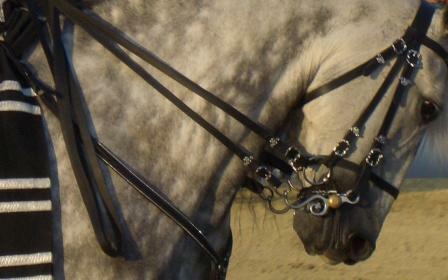 We should seriously question what it is that we want for ourselves and for the horses : Show or actual riding art? Did it have to be like this? According to Fritz Stahlecker, the way the dressage scene has developed is not unreasonable in itself. The force of habit (written down in the rigid guidelines of the German military regulations – “Deutsche Herresvorschrift”) met up with today’s mentality of a meritocracy. It should come as no surprise that doping scandals and controversial training methods are incraesing. In my opinion, the current consumerism in combination with capitalism and egoism of the present time (all these movements are interconnected and mutually dependent). 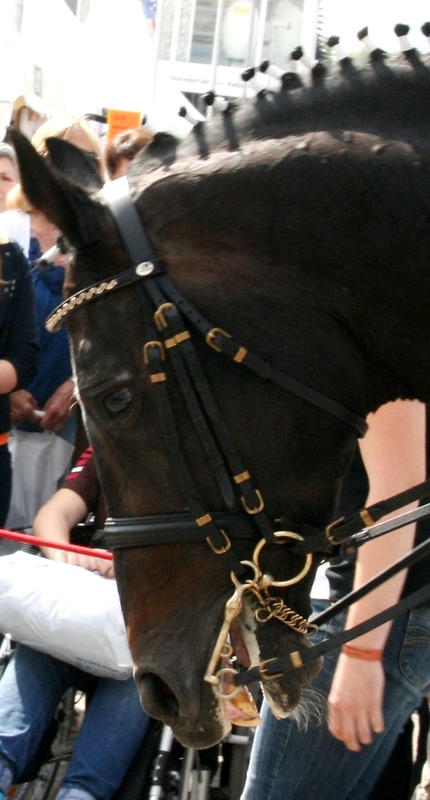 The horse is still , especially in competitive sports, little more than a commodity (consumerism). With its help the rider builds up his prestige. Success in sports on the backs of horses, seperates you from the (common) crowd. It creates an identity. In addition to an identity and fame, there is also the issue of financial viability (the sooner, the faster, the better). What is left behind with this sort of thinking (the health of the horse) is of no interest or simply taken as accepted. What is missing is the humanity, the meaning and connection with nature, and the arts. We are ready to take pain in order to reach our goals. “ In competitive sports,” said Stahlecker, “ the man does uses [a form of] violence against himself. The transfer to the horse was a psychologically obvious step. Elite sport means sompetition, it means violence against oneself “. In the wild, a horse would never exhaust himself to such an extend that it might lead to permanent damage to its health (unless it is in an emergency situation – better a little bit crippeld than dead). However, we force the horse to do so. Violence and art, can never be reconciled with each other, because where the violence begins, the art ends. But why do we need art anyways? Why riding ART? The art and the horse should be united. Each in itself can play an important role in our society. The horse plays an important role in today’s world. We learn from him to empathize more with nature, and to re-discover it. The art takes us back to the aesthetics, an unison and in the end with its perfection, back to nature, as nature is the only thing that is (and creates) true perefection. Proper collection is the most efficient way for a horse to carry itself (and also to move). A horse can only collect itself. We cannot force a horse into collection. Only after I have started my internship at Taonara (Belgium), have I learned what proper collection really means and how it woks scientifically. I also learned the concept of contra collection (by the courtesy of Josepha Guillaum – see article Collection (1)) and finally understood why I always felt like I could not collect the school horses (nor any other horse I ever rode), until now. I feel that it is time to share my new insights with my readers. In order to fully understand what I mean with the concept of collection, it is important that you read both parts of the article collection. And please, feel free to comment. I am curious in what you have to say on this topic! Let me start this article in the same was as I have started the former article Collection (1): Concept and Contra Concept, by trying to define collection. Wikipedia defines collection as “when a horse carries more weight on his hind legs than on his front legs”. As I have already explained in the former article, this understanding of collection is simply wrong. The horse carries around 55% of his weight on the forehand (neck and head), and approximately 45% by the hindquarters. But, these numbers of weight-bearing change constantly, depending on what the horse is doing. When it rests, with the head lowered towards the ground, and one hind leg cocked up, there is more weight on the forehand. However, when it flees there is more weight shifted towards the hind-end (100% weight bearing on the hind legs is achieved when the horse rears). In the picture on the right side, you can actually really see how much weight is one the horse’s forehand (nicely underlined/brought out by the “rider” leaning forwards as well). When a horse can carry more of its weight on its hindquarters than on the forelegs when ridden or driven. His back will be raised as he engages his stomach muscles. He will be flexing at the poll and will carry himself lightly. This makes the impulsion that comes from the hindquarters much greater (…). 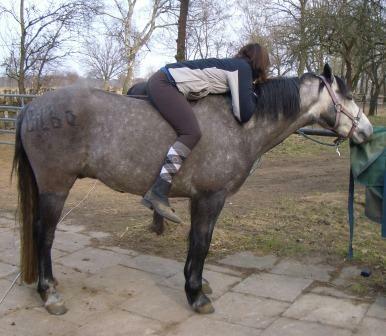 The horse can be more easily maneuvered and can carry a rider with greater ease. 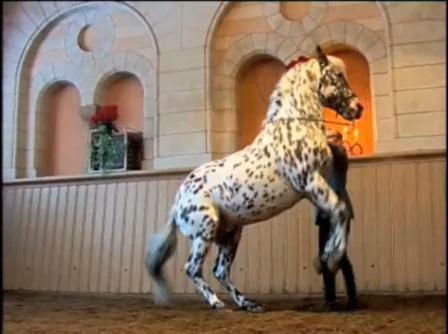 The horse will reach further underneath its body with its hind legs making stops and turns much more precise. Overall, I must say that I like this definition a lot, except for the beginning, since it reminds me of the Wikipedia definition. To me, it has many of the most important elements mentioned in collection. Just compare the bullet points below on collection with this definition, and you will find that there actually are a lot of overlaps. Why do we want collection? 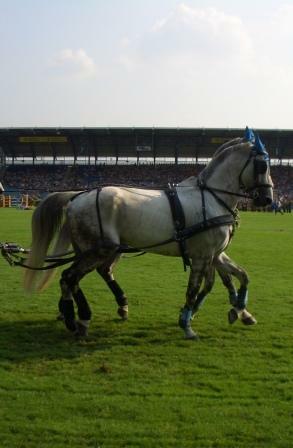 Proper collection is necessary for the horse to carry itself as well as the rider in the most efficient way. Horses are not made for carrying around riders on their back. They must be trained to do so, in order to not break down or get injuries from that. 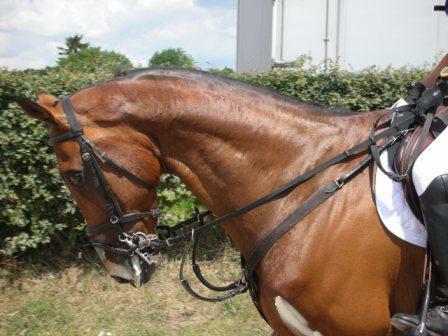 A rider doesn’t only put some extra weight on the horse, but also ads pressure. The horse tries to avoid this pressure by hollowing its back and tense the back muscles (very bad for the horse! And again contra collection!). Another thing that happens when a rider goes on the horse, is that the horse’s balance is disturbed; for a flight animal this can have sever (fatal) consequences. So, before we can even think of collection, we must first teach the horse to stay relaxed, and then to raise his back, and only then can we really start working on proper collection. Furthermore, collection is necessary to get the horse to use its body properly, especially when we ask the horse to do something unnatural, i.e. carrying around a rider on his back. Often, the horse hallows its back and tends to fall on his forehand. From this, many injuries can result, especially relating to the back, the head and neck, as ell as the forehand. Unfortunately, horses are most often not trained in a proper manner and will carry the rider wrong and are usually even taught to perform in contra collection (and even Rollkur). Have you never wondered why there are so many crippled horses coming out of the professional riding disciplines? So, all things considered, proper collection helps the horse to carry itself and us properly, insures safty of horse and rider, improves any type/discipline of riding, and is a necessity for maintining a healthy horse. Proper collection can be observed most often when the horse runs around freely in the field. Collection occurs (in the wild) when the horse feels in danger, intimidates rivals, fight, flight, imponieren (marries or opponents), and when playing around. Proper collection has to do with energy, the ego and balance of a horse. In collection, the energy of the horse is collected. When you look at a horse in proper collection (especially the Spanish breeds), than you can really see the energy contained in a horse. In Spanish bull fights for example one can see a lot of truly collected horses full of nearly overflowing energy! 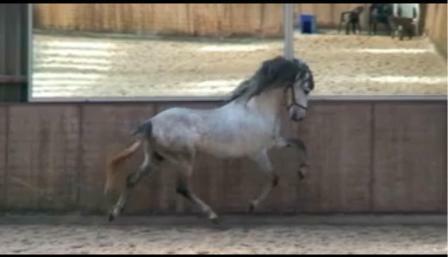 One of the most important (pre)conditions for collection related to energy, is impulsion, which can basically be described as energy coming from the hindquarters (moving the horse forward). Impulsion leads to the engagement of the hindquarters. 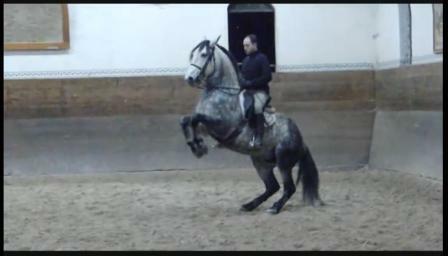 The hind legs are brought deeper underneath the body and for the rider it feels like riding “uphill” instead of “down-hill”. It is important to notice that a horse can only collect itself. We cannot force a horse to collect itself. We can only aid, but we cannot enforce. In order for a horse to want to collect itself, it must feel good about itself – the ego must be pushed (by us) and we will get a horse that wants to present itself to us. In my internship, I have firstly been really introduced to horses that truely feel good about themselves and that love to collect! It is amazing. So, in order to be able to achieve collection, the horse needs strength, flexibility, balance and proprioception, and not to forget, self-confidence and the desire to do so. So it’s not all about pumping muscles, it’s also about the nervous system, comfort and motivation. Collection also has a lot to do with balance. In order for a horse to be collected, it must foremost be balanced – with or without a rider. For a horse it is of necessity to be balanced at all times, otheriwse a predator might have an easy dinner, for the horse cannot run away properly. In this YouTube video, all of the aspects mentioned above, and the bulletin points underneath can be observed! It is important to note that all of these things are interconnected and interrelated. This is due to the horse (bio)mechanics. In this section, I will briefly elaborate on some of the bulletin points mentioned above and try to make the connections between them clear. 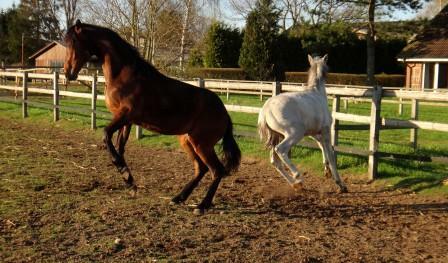 The joints – hip, knee, hock and pastern – are always bent to a degree, which leads to shock-absorbing movements. This bend affects the forehand as well, since, due to the bending of the joints in the hindquarters, the croup is slightly lowered, which in turns arches the spine slightly upward and thus raises the forehand. This increased flexion of the joints during the weight bearing phase, is a prerequisite for impulsion. (See above – energy/impulsion). The forehand of a horse should not be forgotten though, since it is pushed up by the muscles of the shoulder the chest and also somewhat the neck muscles. A horse uses his abs to support the arch of the back and the croup. The tail of the horse should be slightly arched (neither tucked in, nor overtly sticking out) in a horizontal line and then fall down freely, moving gently from side to side. If one induces the horse to assume that carriage which it would adopt of its own accord when displaying its beauty, then, one directs the horse to appear joyous and magnificent, proud and remarkable for having been ridden.